This month, we’ll bring you a series of Q&A’s with our new grads – from Quebec to Tennessee and operations in between. We recently started the recruitment for the 2016 program, so please apply or share in your networks now for Canada and the United States. 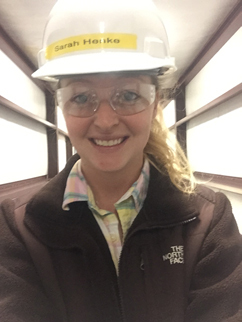 Sarah Henke knew she wanted to work in an industrial environment. Before taking on a process engineering role at Resolute’s Catawba pulp and paper mill in South Carolina seven months ago, she spent the previous summer as a fermentation intern at an enzyme factory. That’s what gave her a taste for the dynamic work chemical engineers can find in manufacturing. Sarah wasn’t targeting work in the forest products sector but was intrigued when she learned chemical engineers had a number of options at Catawba – from process or controls engineering to technical lab work and even management. My current department is paper machine #2. I have many projects that I’m working on, but the priority is to keep the machine running. If there’s an issue on the machine, I’ll gather data from the last few days and look for trends, see what changes were made and figure out how we got to this point. You never really know exactly what your day will be because you always have to be ready to troubleshoot. So the job varies. If we have to shut down a piece of equipment to do work, for example, I might act as the verifier. That’s a safety process where one person locks out the machine, while I confirm what they’re doing and match it against a safety checklist. I have a great deal of flexibility to choose the kind of work I do in a day. If I don’t want to be at a desk all day, I can ask my supervisor if I can work on something that takes me out on the floor. On the other hand, if I want to work on trending and building graphs one day, I can ask for that. It’s a very collaborative, team-based environment. Was it hard to learn the job? It’s complicated, there’s no doubt. When you start, you spend three days on safety training. That’s also where you can see the grand scheme of things, how the mill works and how it all comes together. And how massive this place really is. Then, you start in your department, where you do more in-depth learning about your area. You learn more and more – and every time you think you understand a process, someone will teach you something new. In this [engineering graduate] program, I’ll be doing four rotations of six months each, so I’ll learn about a whole new area of the mill each time. But everyone is helpful and if I don’t know, I just ask. Yes. Everyone here is a real helpful resource. They’ve been through the process engineering tasks many times before. They’ve trended many of the same things and worked on similar projects. Whenever I get stuck trying to find the best way to solve a problem, they always have good advice. What advice do you have for a friend considering engineering work in a paper mill? It can be pretty exciting. But if you don’t like a fast-paced environment and if you get stressed out easily, this is probably not a good fit for you. It’s dynamic and interesting – and there’s so much to learn. What is something you learned that surprised you? Well, I didn’t know much about the industry before I started so I had this perspective that it was just about making paper. But it’s not. Pulp is used to make way more than paper. Tissue and packaging are big ones but it’s also in other stuff like coffee filters, diapers, even car filters. You always hear about how companies are going paperless, but paper is just one part of this industry. Which talent would you most like to have? To paint or draw. What is your idea of perfect happiness? Sitting on a beach in the tropics. What do you consider your greatest achievement? Getting an engineering degree. What do you like to do in your free time? Travel and be outdoors.